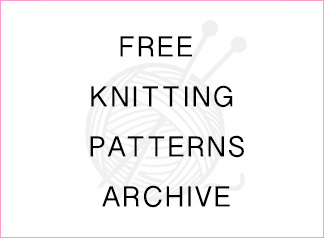 If you like crocheted cushions like me, this pattern is for you. 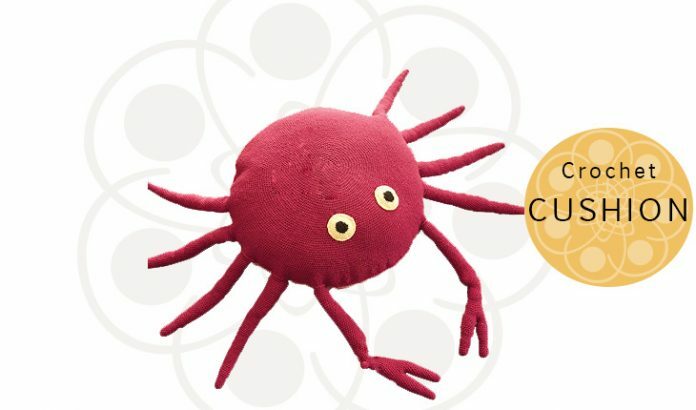 Have you seen these cute crab style cushions before? I think it is much more nice than similar crocheted cushion patterns. This pattern will not be difficult for experienced ones. For beginners, it may be an opportunity to improve themselves. I’m waiting on my blog for questions about the pattern. Good luck. Chain 6 and join the chain. Make 14 single crochets into the circle. Increase on every following row and create a circle in the diameter of 56 cm. Crochet one piece with yarn color no.6964 and another piece with yarn color no.5173. Chain 20 with yarn color no.6964 and then join. Make 20 single crochets on the chain and crochet for 30 cm without increasing. Then separate the piece in two. Crochet for 36 cm totally in two pieces and bind off. Crochet 1 more piece in the same way. Chain 20 and join in circular. Make 20 single crochets into the chain. 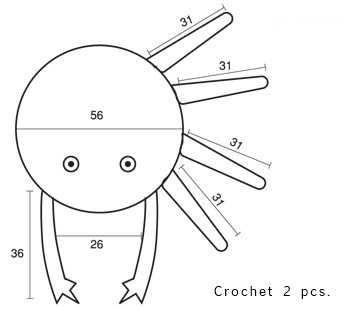 After crocheting in the same way for 28 cm, work decreases on the edges and crochet for 31 cm. Bind off. Crochet 8 pcs. Seam the body parts together by means of single crochet. After stuffing the feet with fiber, sew them to the body. Row 1: Chain 6 and join in circular. Make 8 single crochets into the chain. Row 2: Make 12 single crochets. Row 3: Make 18 single crochets and change to yarn color no.256. Row 4: After doing 24 single crochets, crochet 3 more rows increasing in the same way and bind off. Crochet 2 pcs. Sew on the body.